1997 Called. It wants its subdomain back. The www. subdomain has had a long standing place on the internet, but let's face it, we just don't need it anymore. The sooner everybody stops using www. in advertising, in person and on their websites, the sooner it will fade into memory as another "I remember when..." story the old geeks will tell at the company picnic. Grand-dad's going to a home kids! Check your domain to see if anything can be done to help you ditch the dubs. You already have a 301 redirect from www to non-www on your domain. Please consider using one of our banners on your website to promote the cause. No redirect in place. Both domain.com and www.domain.com are valid domains for you. Google doesn't like when you do this. You can add a 301 redirect to remedy this. You have a 301 redirect going from non-www to www. This is going backwards. You can use the code provided above in your .htaccess, or download the provided file for your server. You have no resolution on the primary domain at all! This means that even a 301 redirect won't work for you right now. You will need to reconfigure your DNS before adding the 301 redirect. You will need to reconfigure your DNS and then use the code provided in your .htaccess, or download the provided file for your server. You may not know it, but www.domain.com and domain.com are considered two separate URLs by search engines. Good SEO requires using only one of these options. Google calls this your preferred domain, or a canonical URL. Your canonical URL is essentially the 'best' option to use as the main domain. A 301 redirect will allow you to redirect all www. traffic to the non-www URL. You can then define this as your preferred URL in Google Webmaster Tools. As a developer, a designer or a website owner there are a few things you can do to help this initiative move forward. Share with your friends and followers from the top of this page. You can check your domain with our checker above. You can manually add the 301 redirect via one of the methods here. You can download and use the provided .htaccess/Apache files. Use one of our banners on your website. Make sure Apache VirtualHosts mod is enabled. This file is zipped. If you are not familiar with Apache Config, you might want to avoid using this technique. You need to edit your IIS web.config file with the below code. Special thanks to QWERTYtech.net for the code. This file is zipped. If you are not familiar with IIS Web Config, you might want to avoid using this technique. Not only does WWW. take time to say, it reduces the amount of room you have in print advertising for your actual brand, and makes kittens cry. Worse than that, it's wasting everybodies time. "But it only takes half a second." you say? If all internet users typed these 4 characters just ONCE per day, just look at how much time we've wasted. And you know that most people don't just type it once in a day. The actual time wasted per day is probably much higher. 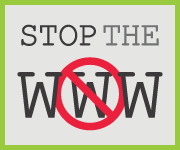 Some websites claim that you shouldn't use a naked (Non WWW) domain for a variety of reasons. Yet it done properly, you are providing a better experience to your users, especially those on mobile devices typing with their thumbs. Here are 10 major websites (And their monthly traffic) that use some kind of www to non-www redirect. It's possible and it works. Just copy and paste the codes below into your website! No kittens were hurt in the making of this website. | Created by @kraymitchell & @strixy | Wanna Fork?